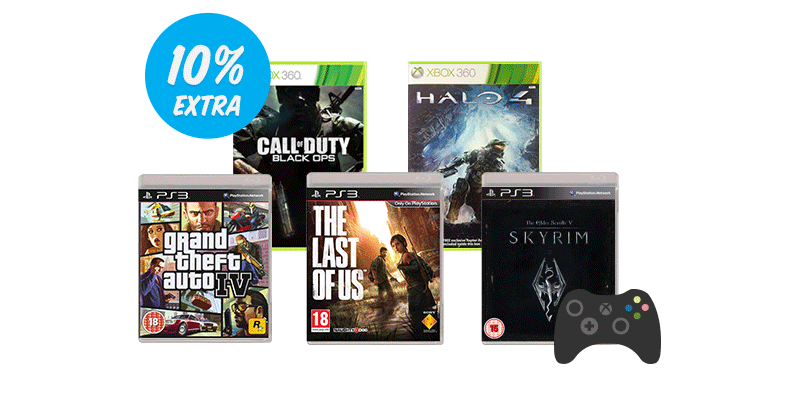 [This offer has now ended] Get 10% extra cash for your games – today only! Please note: this offer has now ended. Keep checking back for more great offers soon! For one day only, we’re giving you 10% extra cash for any game you sell. That includes Xbox One, Xbox 360, PS4, PS3, Nintendo DS and Wii games! Get even more CASH for your games (for one day only)! Get 10% extra for EVERY game you sell – the more you sell, the more extra cash you’ll make! Save up for 2015’s big releases, such as Metal Gear Solid V, Arkham Knight and Halo 5: Guardians (you can view even more great releases here! ), or the games you missed out on last year! This offer ends at midnight tonight. See how much extra cash you could make by hitting the button below.